The Nats currently have 11 big league players on the disabled list (along with depth catcher Jhonatan Solano, who is on the 60-Day DL). That’s more than any other team in the majors. Currently, there are six position players out. Ryan Zimmerman, Matt Wieters, Adam Eaton, and Brian Goodwin are all big blows to the lineup. 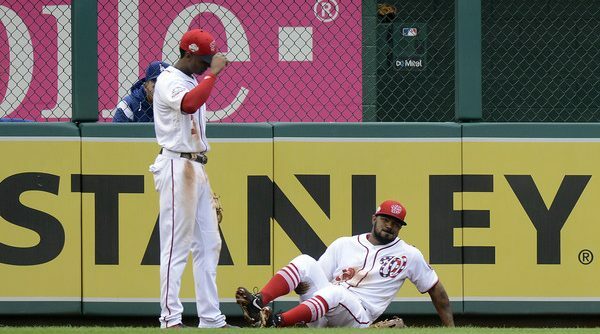 Howie Kendrick tore his Achilles and will not be back. Daniel Murphy has yet to make his 2018 debut. Five pitchers currently sit on the DL: Joaquin Benoit, who has yet to make his Nationals debut, Joe Ross, who is still recovering from Tommy John, and Koda Glover, who is on a very long road to recovery, along with Matt Grace and Ryan Madson. This isn’t mentioning Jeremy Hellickson, who was removed from his last start with a blister concern (though I don’t expect he’ll miss much time if he’s out at all). There are some fantastic and important players who are currently sitting on the shelf, and it’s a bit disheartening to know that the team is out that much manpower. Some we won’t get back this season, and some we still have yet to see. It feels like they’re disproportionately hurt compared to other teams. What happened? Did someone upset the baseball gods? Do we need to make some kind of sacrifice? What do we do while our players go down like flies? Well, what we don’t need to do is panic. I know I’ve felt like panicking sometimes, but it’s not healthy or reasonable. Even though I’ve wanted to rip out my hair many times as the offense has continued to struggle and produce runs, you can’t be screaming doomsday. Fans screaming and panicking is not going to solve anything. What I think can be done is making some moves to bring in some players, particularly some bats. I don’t know when everyone is going to come back, and the Nats don’t need to do anything huge, just something to buoy the team before the cavalry arrives. The Mark Reynolds signing was genius. Especially with Kendrick out of commission, another move like that could serve the Nats well. Another bullpen move could also be in order, especially with the revolving bullpen in effect once again. I’ve said my piece advocating for Craig Stammen, but there are other low-profile pieces the Nats could acquire. It doesn’t need to be flashy, it just needs to be effective. I’ve also heard some rumblings of people crying for the Nats to go get a catcher, but I think they can hold on that particular area for now. Pedro Severino is handling the staff remarkably, and his bat is holding its own. Spencer Kieboom hasn’t given me a reason to call for his removal, either, though he hasn’t been around long enough for me to stake my true opinion on him. Matt Wieters will come back eventually, so the trigger finger doesn’t need to be as quick for this position as it does forever. This seems to be a common refrain, but things will get better. At some point in the summer, a lot of the injured players will come off the disabled list, and they’ll be a super-team again. 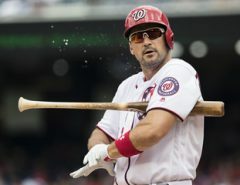 It seems scary at the moment and there’s a lot of pressure at the moment in a packed NL East with the Braves and Phillies proving to be real contenders, but the Nats have yet to be their best selves at any point in this season. They’ll get there, they just need time. And by the way, be sure to take time to thank a starting pitcher today. They’re the only reason this team is alive at this point. Interesting article. But perhaps a little over dramatic? The team is just 1 game out and no one is running away with it. 1. Eaton. Maybe back in late June? 2. Goodwin. Maybe back this weekend/next week? 3. Robles. Maybe back this year? Let’s gloss over immortals like Sierra and Stevenson. 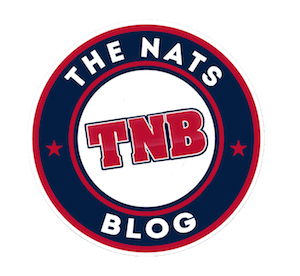 Bottom line is that the Nats have shown depth, resilience, and very good starting pitching to claw back into the race despite a wave of injuries that could easily have sunk the team. Sure, it ain’t been pretty at times—go ahead, name me a team that can go to their #8 option at pretty much any position and not be putting the proverbial “replacement player” out there. In the meantime, Go Nats!